You were wondering, weren’t you? When I was going to get around to making a salad with greens in it? Well, here she is – squeaking in at the eleventh hour. Though the Day 1 salad, Yellow Rice & Black Beans, is my favorite of the seven, this one comes in at a close second. It’s so simple, but the flavors just work. Nutty, sweet, tangy. I served this salad with turnovers that started out as potato-garbanzo bean burgers. The burgers were just okay and I wondered what on earth I was going to do with the 6 that were sitting in my refrigerator. Since they were spiced with garam masala, I continued the Indian theme. I crumbled up a few of the burgers, added some vegetable broth and a handful of golden raisins and made turnovers with a whole wheat dough to which I’d added cumin and curry powder. Dipped in mango chutney (I’m addicted) and homemade Sweet & Spicy Tomato Chutney they blew away any lingering ill feelings about the burgers. And with the scraps of dough (yes, complete with cumin and curry) I made tiny tarts with juice-sweetened cherry and apricot jams. The classic combination of spinach and grapes gets sweet punch from the dressing and toasty goodness from sunflower seeds. Combine the first 5 ingredients in a small bowl or measuring cup and slowly whisk in the flaxseed oil. 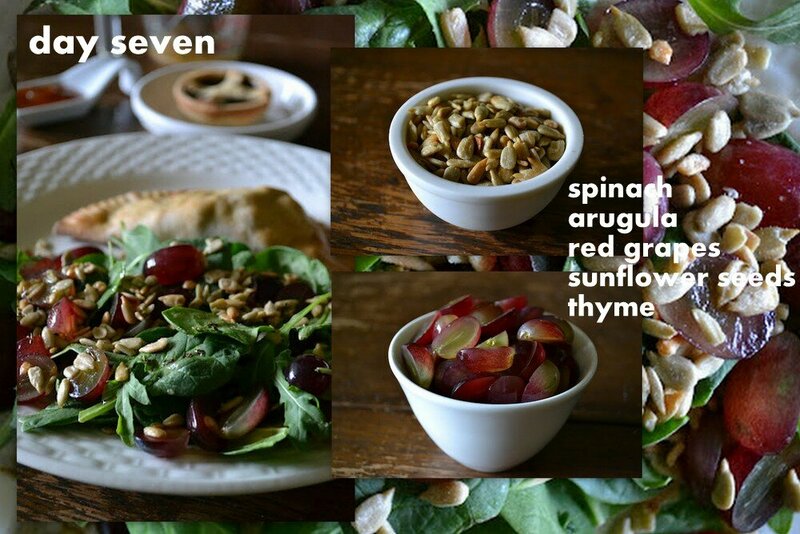 In a big bowl, combine the spinach, arugula, grapes and sunflower seeds and toss gently. Divide greens between 2 plates and drizzle with dressing. Everything looks simply divine! Those little tarts are so adorable and your turnovers sound super scrumptious! The salad looks so simple yet so refined and sophisticated! All 7 of your salad posts have been just beautiful! Thanks so much, Rachel! I can’t resist tarts/turnovers/pie – anything with a crust! But between you and me, I’m ready for a break from salads! I just want to say I Love what you are doing with your photos lately! Very impressed. Sorry to see the salad series come to an end. It was hard to choose, but I’ve gathered ingredients to make one into my lunches this week… the others I hope to try soon. This one looks easy enough to throw together during the week. I often throw fruit in green salads too. Grapes are a favourite with the kids. The tarts are too cute. Thank you! I’m having a lot of fun taking pictures and messing w/ them on Picasa. Addictive! I just discovered your latest cookie post…talk about treats I love! mmm I have arugula growing like weeds all over my garden haha, I love this stuff 😀 …and now I know what to do with it! Lucky you!! It’s my favorite green. Lovely! What a great week of salads. Thanks! Now it’s time for some goodies :-)! Perfect sweetness from the grapes and crunch from the seeds! YUM! Red grapes in salad (a very good idea), and what a great combo of deep crispy greens! Gorgeous! Yum, spinach, arugula, and red grapes are some of my favorite salad ingredients. Congrats to your 7 days of salad!